Wake in the morning to mist filling the valley and watch the view unfold across the golf course. 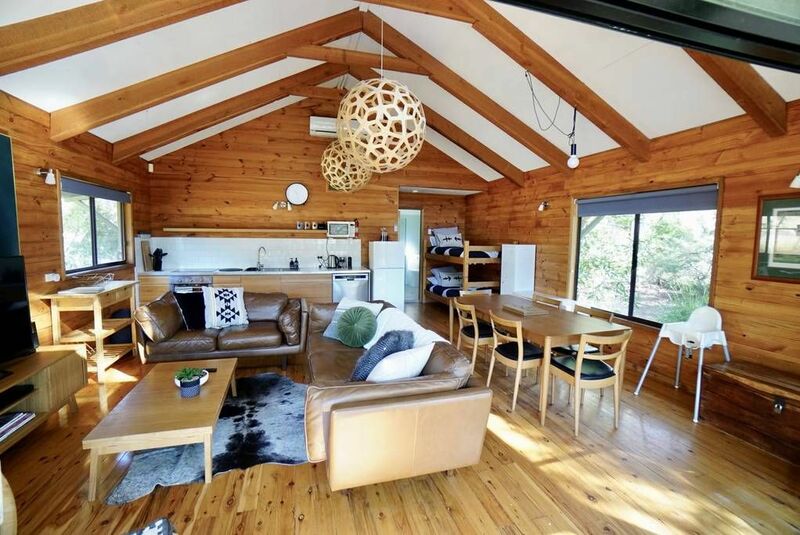 This one bedroom cabin is picturesquely set on the Kangaroo Valley Golf and Country Resort amongst an 18 hole golf course and 99 acres of bushland. Our finest accommodation cabin in Kangaroo Valley NSW has all you need for an escape form the hustle and bustle of city life. Only 2 hours from Sydney and affordable price, this cabin sleep 6 people - 1 queen bed and 2 bunk beds in the bedroom and another 2 bunk beds in the L-shaped living room.Located on the Kangaroo Valley Golf and Country Resort. This peaceful cabin provides total relaxation with a newly renovated bathroom and tastefully decorated with contemporary and country style fixtures and furnishings inspired by nordic cabins. Flat LCD TV, Bluray and CD/IPOD player are provided as well as a fully equipped kitchen with Dishwasher and Espresso Machine and all linen included. 24 hour access via a keylock box located at the cabin so no interaction with your hosts is needed. Our cleaner is located next to the resort if there is any issues. Originally designed by Jack Newton, the course has been extended to provide the discerning golfer with 18 holes of enjoyment on our Championship 71 par course. Although not long at 5775 metres from the back markers, the course is quite testing for even the best golfers with undulating fairways, testing greens and dams coming into play on quite a few holes. Golfers at all levels are catered for with 4 different sets of tees allowing you to play from the tees that you are comfortable with and which suit your ability. Give us a call now for the best family holiday accommodation in Kangaroo Valley NSW. The whole cabin is rented as one space. We are beautifully decorated with all the modern conveniences of Dishwasher, Nespresso machine, induction cooktop and fully self contained kitchen. I have sourced organic lemon myrtle bathroom products and the bed is made super comfy with a memory foam mattress cover and Egyptian cotton sheeting. There are two ways from Sydney, we have found option 2 to be the quicker way. 1.Scenic coast road, take the M1 and follow the signs from Berry to Kangaroo Valley. 2.Country drive, follow the M5 motor way to Mittagong and take the Bowral/Mittagong turnoff, from Bowral follow the signs to Nowra/Fitzroy Falls from Fitzroy Falls to Kangaroo Valley.(approx. ½ hour from Bowral to Kangaroo Valley). When you arrive at the entrance to the village, past the bridge, you will see a turning to the right signed for Mt Scanzi Road and Kangaroo Valley Country Club. The entrance to the property is approx. 5km along this road Total journey approx. 2 hours depending on the traffic out of Sydney. After driving through the pristine golf course absolutely packed with ducks and Kangaroos, we were blown away by walking into our cabin for the weekend. Such a great cozy feel, and brilliantly decked out to feel like you're in the Rocky's with no one in sight. Such a perfect atmosphere for us to put our feet up, and finally relax. Although it was a tad difficult to find at first it was a beautiful cabin. A/C was available (a lifesaver in the suffocating heat) and the space itself was comfortable, nicely decorated, and had all the amenities advertised. The location was gorgeous with a forest only a short distance from our cabin - the swimming pool and tennis court nearby were also put to good use. Only minor complaint was the lack of wifi so be sure to bring board games to entertain yourself if you're going to be in the cabin for long periods of time. Other than that we had a great stay! Our holidays were fantastic! Truly loved the property condition. Appreciate the level and quality of amenities provided, especially the coffee maker, including the pods. Though I have some doubts about the quality of sugar and coffee JARS. The coffee jar cracked, as soon as I tried to open it, and trust me, no force was applied at all. BUT that's a minor thing and mishaps do happen. I have literally caught some virus and would be on antibiotics for another couple of days. BUT, obviously I should be giving the benefit of doubt as I might have attracted the virus in the pool or through other outdoor activities. Apart from that, I can proudly say that those were one of the best vacations we ever had. Our kids really enjoyed and We would love to spend our holidays at this property again. Well done and keep it up Jenny! All the Best! This cabin has a great wood interior design that gives you a country feeling. The view is amazing. I would consider this place for my next visit..